If business decisions could be like layups, Disney mining their classic animated films and re-creating them in live-action would be a Steph Curry drive through the lane. The idea of taking a previous movie such as Cinderella or Beauty and the Beast and putting live actors inside the story with visually appealing set pieces seems obvious. Actually, to keep with my basketball metaphors, this formula would be an Aaron Gordon, over the mascot, during the NBA All-Star Weekend slam dunk. Because of this, The Jungle Book had every reason to just go through the motions. Why work *that* hard when a large sum of money would certainly be accumulated and an A-plus quality voice cast would be easy to bring on? Against all odds, director Jon Favreau and screenwriter Justin Marks crafted a spirited, exuberant entry into the Disney library that pays homage to its predecessor, but also uses its own resources to create a re-imagining every bit as animated as the original. The story is the same. Mowgli (played by newcomer Neel Sethi) was left in the woods and is found by Bagheera (voiced by Ben Kingsley), a panther, who takes him in and sets him up with a home within the wolf pack, led by Akela (Giancarlo Esposito) and Raksha (Lupita Nyong’o). As Mowgli grows, he attracts more attention, specifically from the tiger, Shere Khan (Idris Elba), who wants to spill Mowgli’s blood due to a previous encounter with the humans — leaving him scarred. 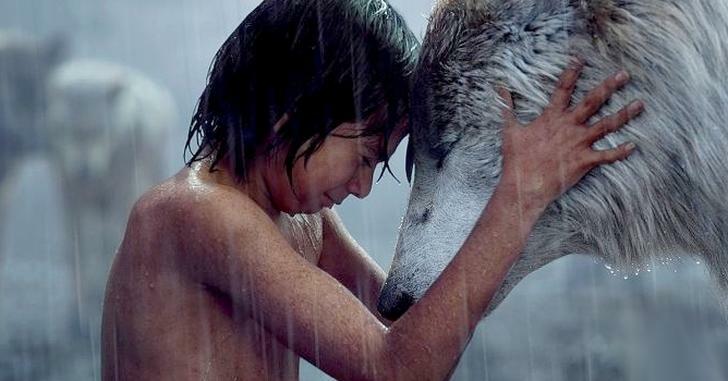 After a threat by the tiger, Mowgli leaves the wolf tribe and escapes into the woods where he finds companionship with Baloo (Bill Murray), who helps him develop his individuality. Draped in high-tech computer effects, The Jungle Book feels as real as it looks. Lush forests of trees and swimming brooks create the effect of walking through an Indian jungle, even when you know that the green screen did most of the job. This understanding is ditched early on as Favreau designs a reality that is both lively and fearsome, but all the more real amidst its digital origins. Favreau’s last film, Chef, is a rather overt allegory for his frustrations with the Hollywood system. In that film, Favreau stars as a former all-star chef, who is relegated to serving “the country club crowd” and feels he has lost his mojo after his boss rejects any sort of artistic ambition he tries to place on the menu. After a breakdown in front of a food critic, Favreau’s character decides to run a food truck and treks from Miami to Los Angeles cooking up Cubanos and getting his groove back. While his most recent Hollywood endeavors (Iron Man 2 and Cowboys and Aliens) may have signaled this autobiographical examination, he seems both artistically and financially fulfilled with this film that breaths new life into a timeless classic. Initially, it is tough to see how fitting a story, which worked flawlessly in the animated format, into a live-action setting along with talking and singing animals, but the end product is wildly successful. With a lot of aid coming from the visual effects team, the speaking moments between the animals seems as natural as they could possibly be (even though I wouldn’t recommend doing live research on animals to find out). The natural effect that Favreau imports to the film structures the bustling plot and characters and makes it a carefree ride to get swept up in. What The Jungle Book does so well is rekindles (or ignites) your passion for classic Disney, but allows room for the 21st century. While the original was easily a classic, the additions of actors such as Ben Kingsley, Bill Murray, and Idris Elba creates a brand-new experience that allows this remake to feel new. Elba gives the film’s best performance as the evil tiger, rolling his lines off the beast’s furry lips with intensity and ferocity — striking a fully realized fear into the heart’s of the audience and creating one of the most intimidating villains in a recent blockbuster. Kingsley does the same, but in a more positive light, as the father-figure for Mowgli and guiding force in the plot. But, the show is stolen by Murray as the instantly lovable bear that climbs up your favorite character of the year list as quickly as he comes up with a scheme to get honey. Though, at its core, it is just Bill Murray in bear form, the dry wit and likability of Murray’s performance adds a layer of sentimentality and humor that feels organic. We love Baloo, not just because he is voiced by Bill Murray, but because he is a version of a character that Murray has played his entire career and one that wraps us in comfort. The same cannot be said for newcomer Neel Sethi, who gives us the only human performance in the entire film, and one that requires a demand for a strong screen presence. Sethi’s performance is at times amateurish, and while it doesn’t detract from the film, a more skilled performer (say something like Jacob Tremblay in Room or Pierce Gagnon in Looper) would’ve propelled the film to an even higher level. Even with the weaker performance by its star, The Jungle Book swings to new heights and ones that I wouldn’t have expected a Disney retread to do. I am still not thrilled to see the company — which has more money than it knows to do with — digging into its past to create new movies when it should look to the future and more original content. That being said if this is a precedent of what we can expect, it may be something to monitor in the future.